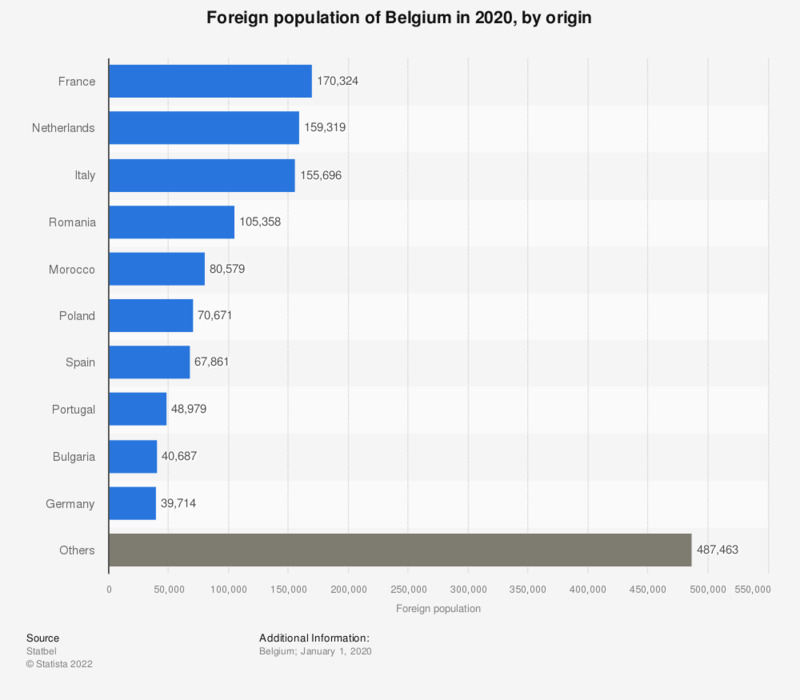 This statistic shows the foreign population of Belgium in 2018, by origin. The majority of the foreign population in Belgium had their origin in France, Italy or the Netherlands. On January 1, 2018, about 165,000 foreigners in Belgium had the French nationality, roughly 156,000 had the Italian nationality, and approximately 155,000 had the Dutch nationality. In neighboring Luxembourg, Portuguese formed the largest group of foreigners, as shows this statistic on the number of foreigners in Luxembourg by nationality. Approximately 97,000 Portuguese live in Luxembourg, much higher as the number of Portuguese living in Belgium, even though Belgium's number of inhabitants is much higher than Luxembourg's. The French and the Italian are well-represented in Luxembourg as well, but those communities are much smaller than in Belgium, with roughly 46,000 French and 22,000 Italians living in Luxembourg.